There are times when our day jobs really get in the way of our lives and now is one of those times. Dave and I have both been so busy, between traveling and working late, we have not made it to the grocery store in weeks! We are completely living out of the pantry and the freezer, which is another reason I love making extra soup and casserole, to freeze for these busy times! It's seriously getting down to slim pickings now -even with a real quick grocery stop for a few veggies the other day. So tonight, I had a few veggies and I have some wheat pasta, put those together and what do you get? 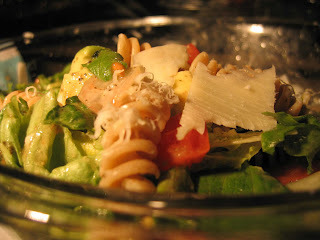 A pasta lettuce salad. This actually worked out great, and you can substitute whatever you have in your fridge! The pasta gives the salad some substance. I would have loved some croutons or nuts in here, maybe some fruit or craisins. If you have it, top this salad with some protein like chicken for a more complete meal! I'm just don't have any! Boil the pasta according to directions. Drain and rinse in cold water. 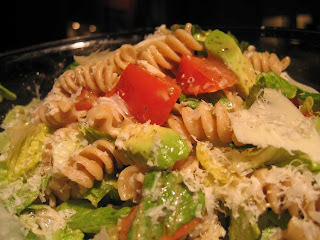 Place in a large bowl and add lettuce, chopped avocado and chopped tomatoes. Toss with a balsamic dressing and fresh ground pepper, then top with Parmesan cheese. So simple, light and versatile. The second option here is to add the pasta while its hot. This is going to wilt the lettuce slightly, so serve immediately after tossing. But the warm pasta will give this salad a more hearty and wintery feel. Plate your salad and for just a few minutes forget about work... enjoy your salad and be fat and happy. !